A C++ plugin that provides QML alternatives for QSensorExplorer, QPropertyInfo and QSensorItem C++ classes. A QML Application that uses the QML types to read the sensor meta-data and present it. This example is built as an executable with C++ code that runs the QML, but it can also be launched directly using the qmlscene tool. You should build the top-level sensor_explorer project before trying to run this example or it will not be able to find its dependencies. Above, the -I . parameter adds the current directory as a module import path to locate the Explorer QML module. The Sensor Explorer QML import defines the Explorer QML module, exporting QSensorExplorer, QPropertyInfo and QSensorItem C++ classes as QML types. The source code is available in the sensor_explorer/import subdirectory. 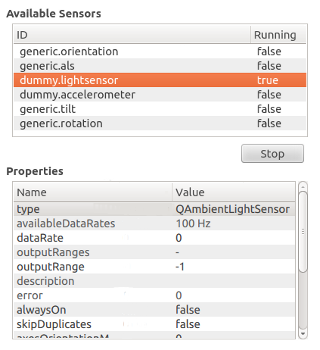 The example uses the returned list as a model to populate a view of available sensors. The property list is used as a model for another view that displays the property names and values.